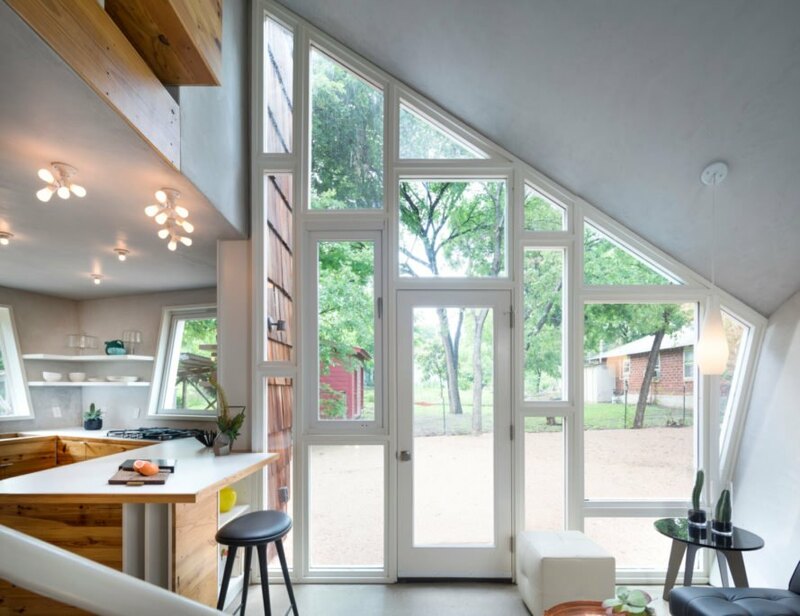 Strict building restrictions often dictate the design of home additions, but in certain cases, savvy architects know just how to work around them. 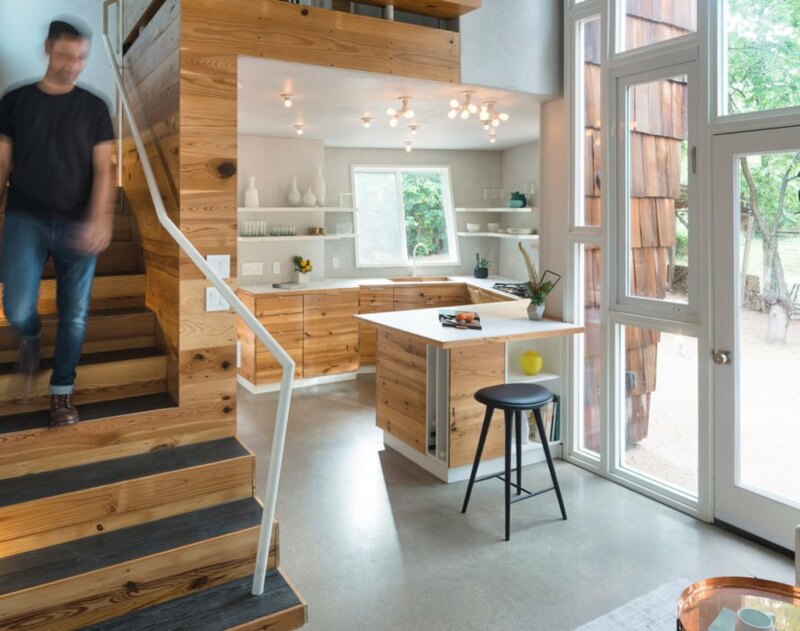 Case in point is architect Nicole Blair, head of Austin-based Studio 512, who has just unveiled The Hive guesthouse, a tiny home that expands as it rises upward, evoking the shape of a beehive. 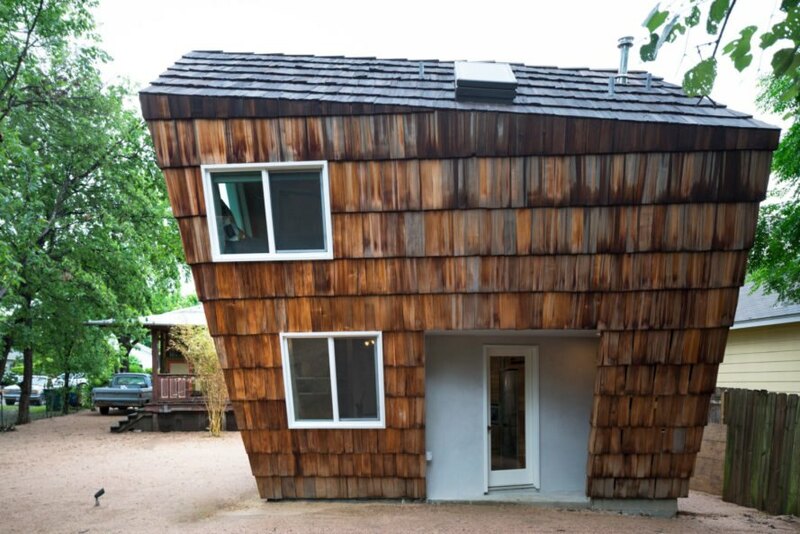 Built as a guest house for a residence in Austin, The Hive’s unusual shape is a solution to local building codes that required that the footprint of structure be confined to a maximum of 320 square feet. Not one to be limited by such regulations, architect Nicole Blair found a smart way to abide by the rules while still creating a gorgeous extension. Inspired by the shape of a beehive, Blair simply added a second story using walls that slant upward and outward from the base. This way, the walls expand as they rise, providing extra space to the second floor. 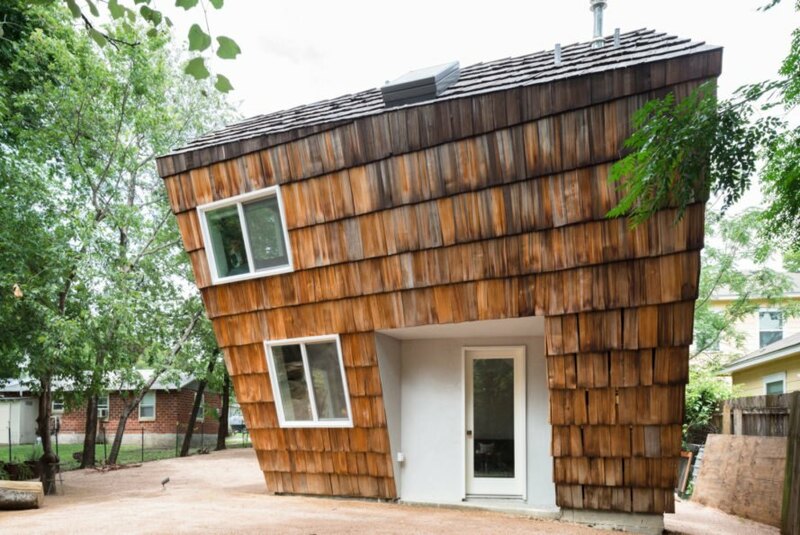 Clad in large cedar shake siding repurposed from old roofing material, the charming tiny home with a very unusual shape is certainly eye-catching. The dramatically slanted walls and large windows framed in white add a touch of fairytale whimsy to the dynamic design. From the tilted kitchen walls to the spacious, angular bathroom to the sloping bedroom, the structure’s geometric character — and quirky personality — is evident. The small, covered entrance features an outdoor shower installed adjacent to the front door. Inside, the living space and kitchen are found on the first floor, where an open layout seamlessly connects the two spaces. In the kitchen, the angled walls also provide more counter space. Between the kitchen and living room, a wall of multiple glass panels bring in natural light. 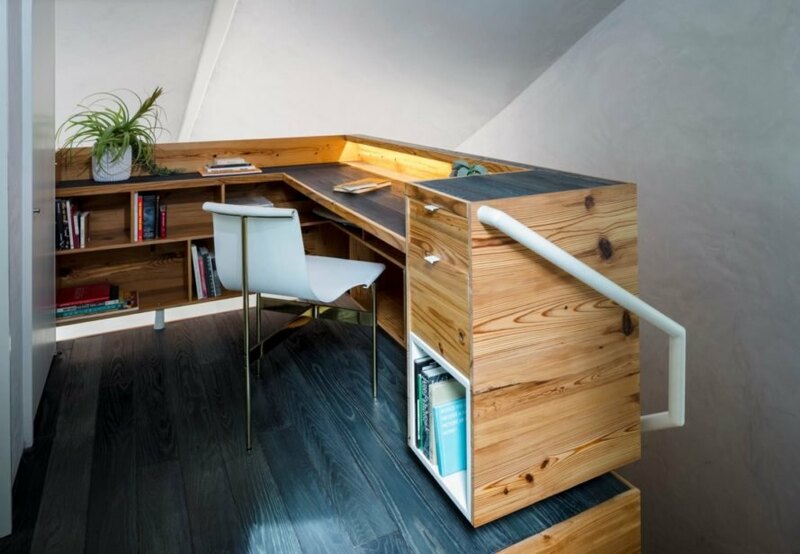 A set of dark wooden stairs leads up to the second level, which houses the bedroom, bathroom and a small work space. 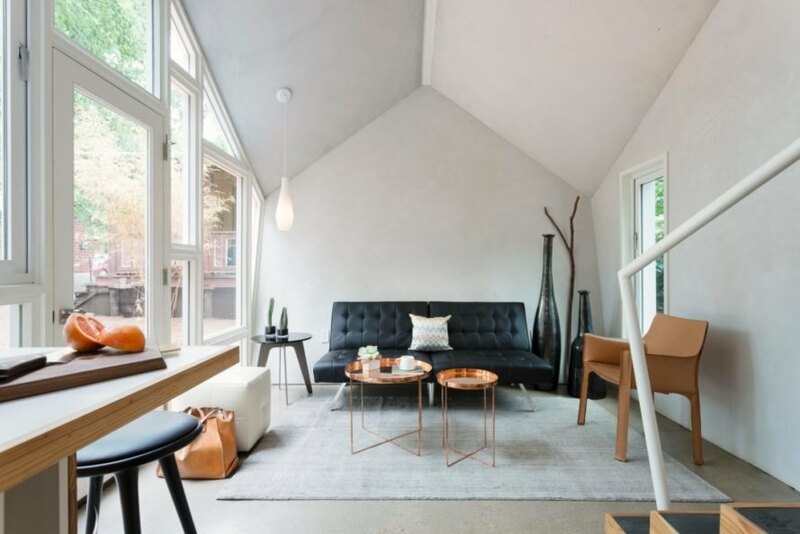 Throughout the tiny home, bright white walls and ample natural light lend to the vibrant, modern aesthetic. The neutral color palette is contrasted nicely with a smart collection of modern furnishings and a mix of unique features such exposed copper pipes, blackened wood flooring and kitchen cabinetry made from reclaimed longleaf pine. Studio 512 designed The Hive guest house. The geometric home is clad in cedar shake panels. The interior living space is light and airy. 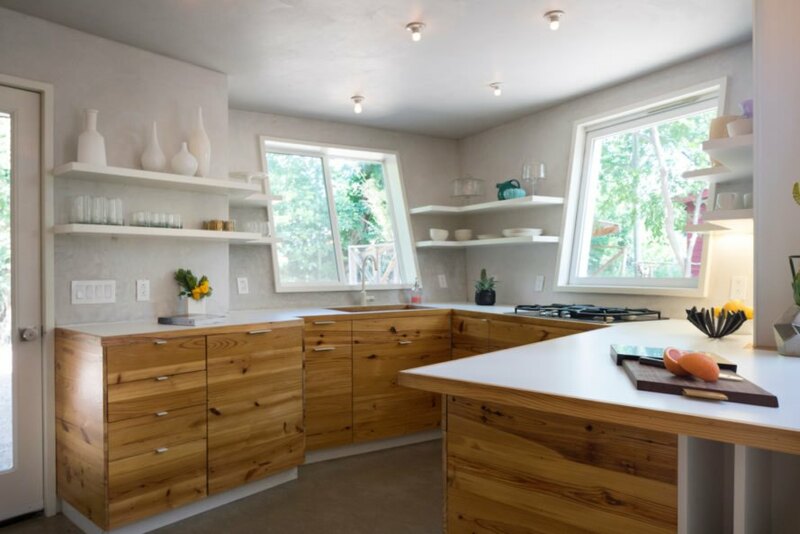 The kitchen features a glass wall for views and natural light. A set of stairs wind up toward the spacious second floor. White walls and natural light lend to the home's modern aesthetic. The walls slant outward to add extra space to the home. 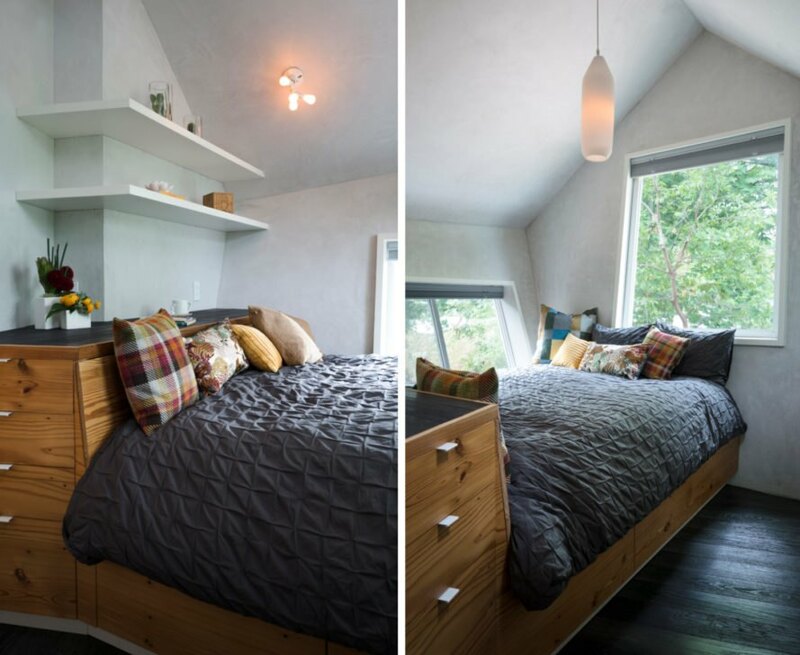 The high angled ceilings make each room feel larger. Every area, including the bathroom, has sweeping angles. A work space was installed at the top of the stairs. The cedar shake cladding is made from old roofing material. The unique design is quite eye-catching.